Some people have called me ‘creative’ but when my son came home with a school project, I think I went a little too far. He was required to make a ‘mini beast’ from junk materials around the house. I immediately thought ‘tomatoes’. Don’t ask me why because I don’t know. I’m like that sometimes – I hear a word, an idea and my brain instantly comes up with a matching solution. I start to run with this, sensible or not. After much deliberations (and convincing my boy it was a good idea), we decided to make a ladybird out of tomatoes. It made sense! Tomatoes are red so all we’d need to do is make black circles on it. We would use straws as feet and some blu tack for eyes and mouth. Genius! *We had straws at home. We waited and waited but the black circles were fading instead of drying! With heavy hearts, we had to dispose of the faceless tomato. Enter Plan B (I always have one of these – life saver). 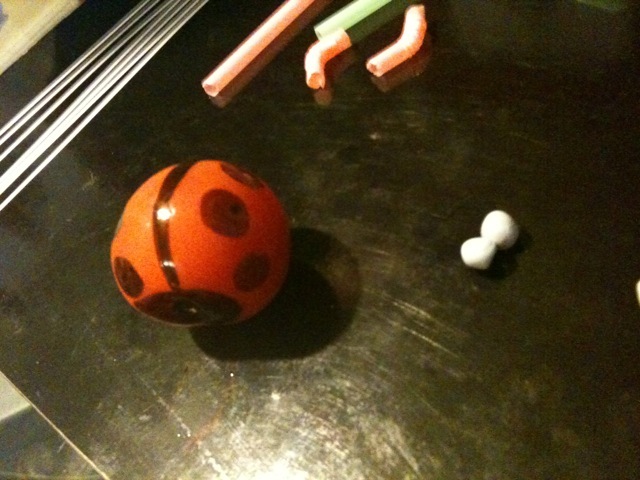 I rummaged through my son’s toy box and found a small ball. I got some paper and asked him to colour it completely red. He loved contributing to this (It was turning into my project until this point). With the red paper complete, we made black circles and covered the small ball with it. 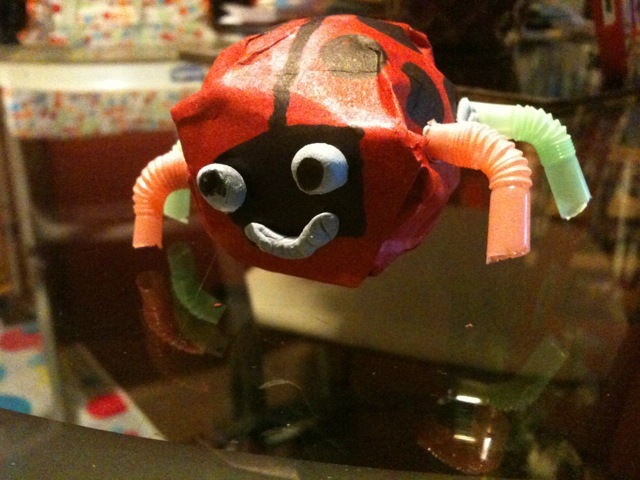 A little glue and tape created the beginning of a ladybird. Then we added eyes and a smiling face. The legs went on and Tada!!!! Welcome Mr. LadyBird the Mini Beast. Cheers all round :).